S’mores Brownies are the perfect summery treat with no bonfire! 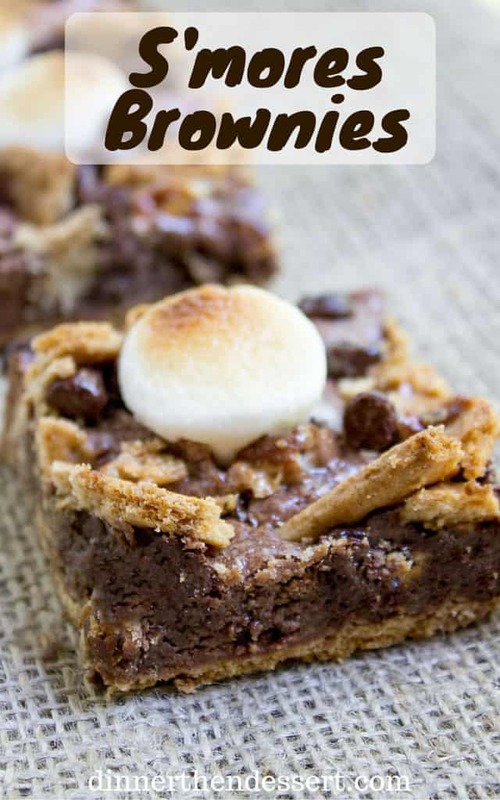 S’mores Brownies are easy to make and will have you forgetting that we are quickly approaching the end of summer. They’re a breeze to make and share and since you are using large marshmallows that are added into the brownies at the end of baking they won’t melt and disappear into the batter. 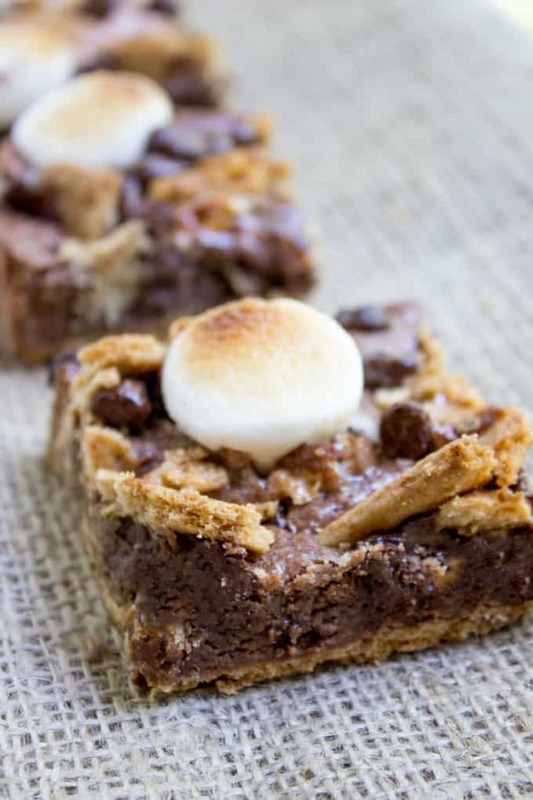 The S’mores Brownies are made with a layer of graham crackers as the base because as they cook the batter will moisten the graham crackers until they also have a soft cake-like texture. 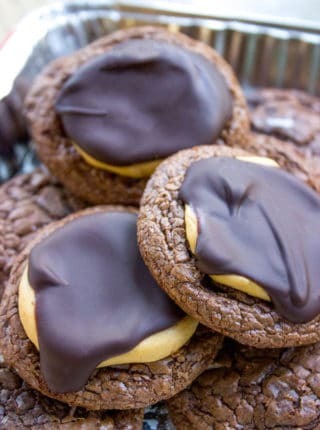 The graham crackers on top are tossed with melted butter because it helps keep them moist and rich even though they’re not protected by the brownie batter (and let’s face it they taste AMAZING crisped up in melted butter). S’mores Brownies may not be the most classic version of s’mores you will enjoy this summer, but you can make 18 servings at once, you’re not going to give yourself a second degree burn handling molten marshmallows and you won’t need to figure out how to clean liquid chocolate out of your toddler’s clothing. Did I mention graham crackers tossed in butter and crisped? It’s like the best graham cracker crust you always eat from your cheesecake first or yell at your husband/wife for stealing when they take a bite of your dessert. 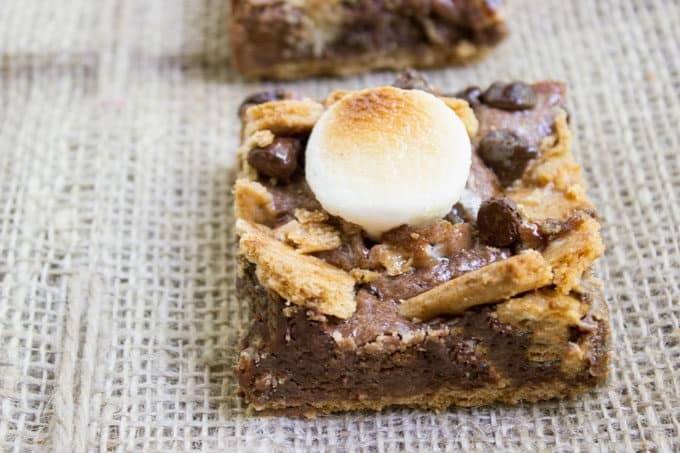 They also contain two types of chocolate chips; dark chocolate in the brownies to create a really rich brownie base and milk chocolate chips on top to provide the classic S’mores Brownies flavor you expect. 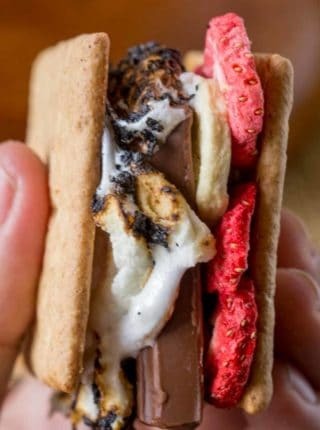 Need some more S’mores in your life? 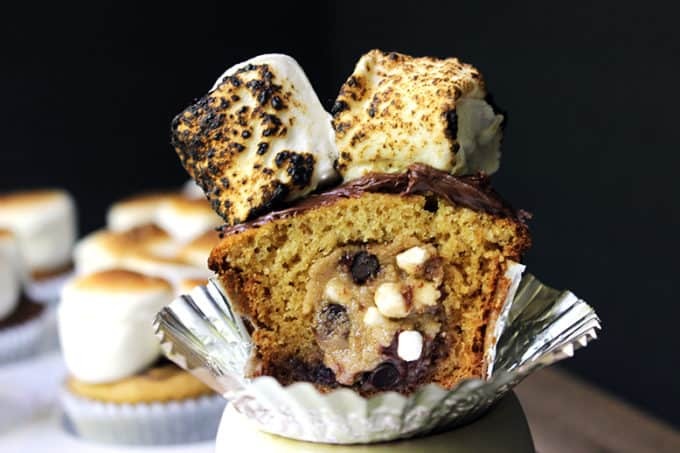 There’s always Graham Cracker Cupcakes filled with S’mores Cookie Dough, topped with chocolate ganache and toasted marshmallows! You can never have too many S’mores Brownies or cupcakes but you can rest assured you’ll easily be able to enjoy them all year long. Milk Chocolate Chips – The perfect flavor for the tops of these brownies and the authentic s’mores flavor. For more information about how I source my Guittard chocolate chips and for the best possible price (~$2.00 a bag) and save a ton of money on them you can read my long rant about chocolate chip prices on my Sprinkles Blondies post. The links above to Amazon are meant to be informational for those chocolate chips, you can definitely get them locally for less. S'mores Brownies start with a graham cracker base and rich chocolate brownie. They're topped with buttery graham crackers, milk chocolate chips and toasted marshmallows for the perfect summery treat with no bonfire! In a large bowl, add the butter, sugar, vanilla and eggs. Add in the cocoa powder, chocolate chips and salt and whisk until well combined. Add in the flour and whisk until just combined (don't overwhisk). Line the bottom of the greased pan with graham crackers. Don't worry if there is small amounts of space in between. Pour the batter over the graham crackers. Break the remaining graham crackers in pieces about 2 inches in size. Toss very gently with the 2 tablespoons of melted butter and carefully place into the top of the brownie batter all over the pan. 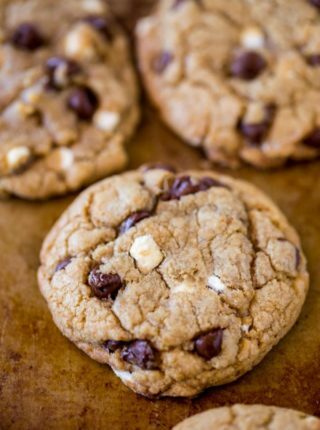 Sprinkle on the milk chocolate chips. Remove from the oven and lightly press the marshmallows into the top of the brownies. Turn the oven onto broil. Place in the top rack and watch it very closely for 30-45 seconds or until just browning. Remove and cool on a rack until no longer hot. 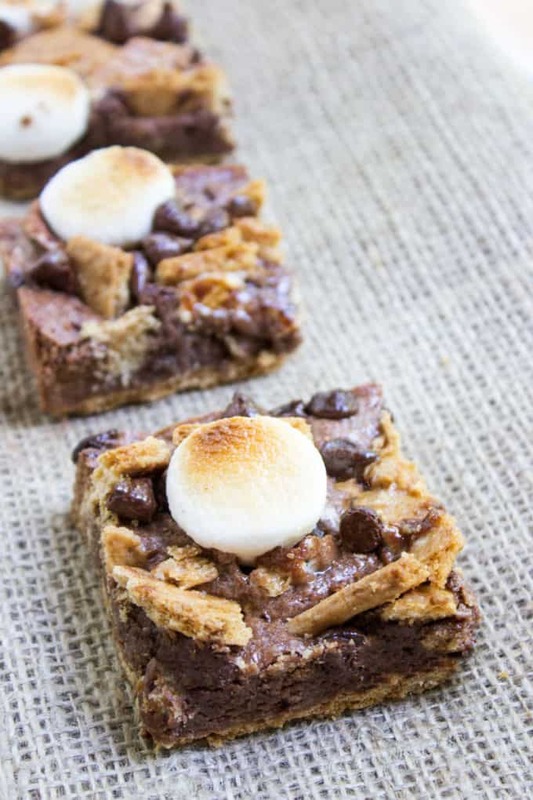 These s’more bars look luscious! I love the toasted marshmallow on top— so dreamy! Oh, and I wanted to tell you I listened to you podcast on Chopped a few days ago! You crushed it!! Awesome job!! I would literally want to eat ALL of these!! I can always use more brownies AND smores in my life! I love a little smore’s indulgence now and then. 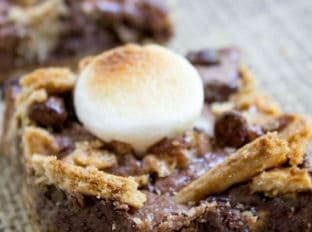 Okay, honestly I want all the Smore’s at the party especially right now i’m craving these brownies. On Point! I wish I had one (or two) right now! I love that you’ve included a brownie base — can it get better?! Yum! 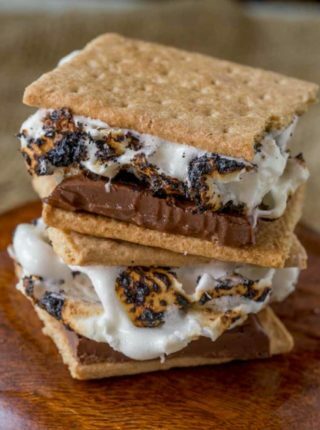 Give me anything and everything s’mores! OBSESSED! Oh. My. God. I just gained 10 pounds reading this! LOL This looks like a very good way to toss my diet under the bus! These look perfect! Why bother sweating around a fire when you can just whip these up and toss them in the oven for a while! I heard you on the Chopped Podcast! It was fantastic! In fact, that’s how I discovered you. Congratulations on your great success in such a short time! 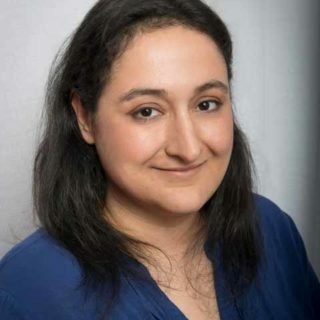 I really like your blog. Thanks, Cathy! I’m always happy to welcome new readers!